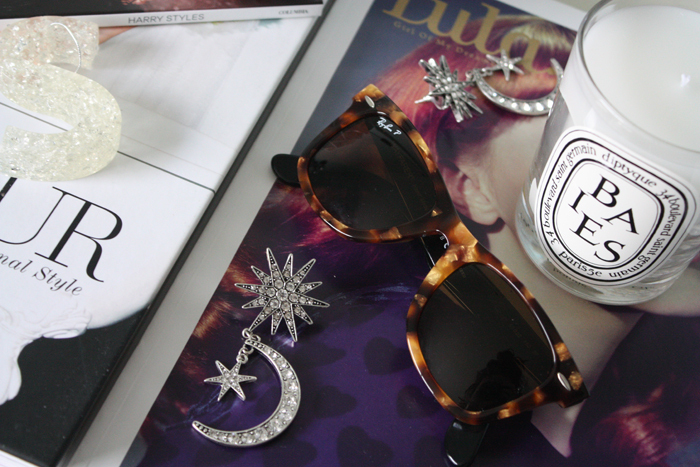 Baies Candle x Diptyque, a gift-This was a thank you gift for housesitting and no joke I was like "Baies, for me!?!?" before quickly peeling away the plastic wrapping from the box. I promise I don't like this candle just for the somewhat catchy name, Baies=bae. The scent itself is divine. Combining roses and blackcurrant leaves, it's just exquisite. You'll notice it's not been burnt yet. I'm trying to finish up my Figuier candle first. Ray Ban Wayfarers*-Sixteen year old Sophie would be so excited if she knew she'd one day own real Wayfarers. I did have a pair of much-loved knockoffs from Equip (RIP) but I broke them on my first ever day of Uni (again, RIP). These are a classic shape and while I'd probably suit the oversized style a bit better than these I still love the way they look on. The tortoiseshell frames adds a point of difference too. Side note; I love the sturdy case they come in as well and the lenses are perfectly tinted, not too dark, not too light. Actually these are great glasses for driving. Can you tell I love 'em just a bit? -Do you have any luxe loves? *These snazzy shades were sent to me by Smart Buy Glasses. This post is not sponsored and all love of classic, iconic eyewear is my own.